Best wall-of-sound hook monster 45 I've heard since the first one from the FM KNIVES - power pop/punk is usually near the nadir of my listening priorities, but I've heard a few stone knockouts from Oakland's CLOROX GIRLS before, so I gave this one a whirl. I'm real glad I did. 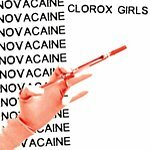 "Novacaine" has huge, cavernous hooks, harmonies, and a gi-normous burst of raw, explosive guitar. Terrific vocals, as well - if they're not humming this one down at Sam's Hof Brau 24/7 then I'm totally stumped. They're probably also pogoing to the blink-&-you-missed German-language blazer "Nicht Meine Stadt", and the closing "Trashy Daydream" is ultra-fine EYES/ZEROS-ish hard melodic punk as well. Nice work. I hear that it's just bang-bang-bang with these guys live as well, so maybe I ought to find an excuse to drive 20 minutes and check them out. This 45 is probably the ammo I need. You can get yours here!